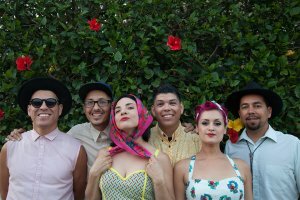 A “uniquely Angeleno mishmash of punk, hip-hop, beat music, cumbia, and rock…live, they’re magnetic” (Los Angeles Times). Las Cafeteras create a vibrant musical fusion with a unique East LA sound and positive message, a mix-and-match of styles and sources that deliver socially conscious lyrics in both English and Spanish. Their wildly vibrant Afro-Mexican beats, rhythms, and rhymes document stories of a community looking for love and fighting for justice in the concrete jungle of Los Angeles. Students $12-$20; General: tickets start at $20.